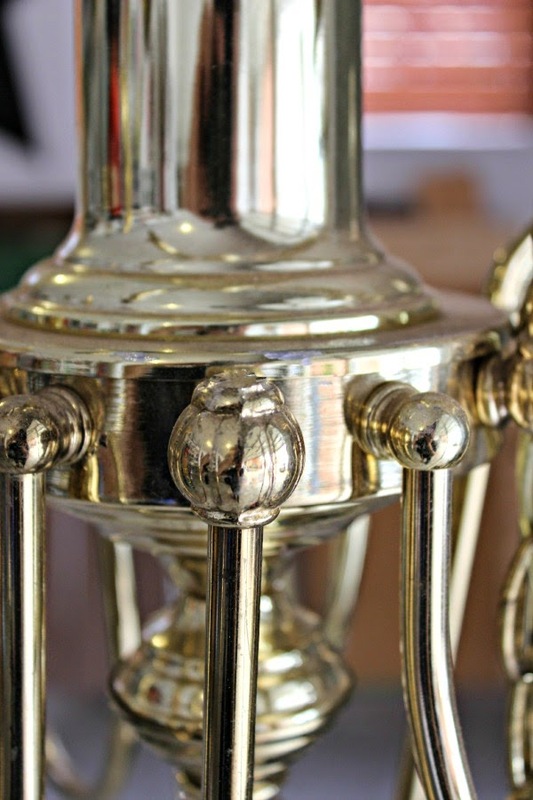 There were a few things that I didn't like about it and dated it in my opinion, mainly the super shiny finish and the flourish accent pieces. I knew that paint would be an easy fix for the finish, and came up with a plan to simplify the design and make it look a bit more modern. I used a Dremel with the appropriate attachment wheel for cutting metal to cut the fan accents off. I tried to make as straight of a cut as possible for a nice clean look. They were solid metal so it took a bit of cutting, but the Dremel did a great job and sliced through fairly easily. Some sparks did fly while I was cutting, so take care if you try something like this, and be sure to use the appropriate safely equipment (glasses!). After filing the rough cut edges smooth, it was ready for paint! 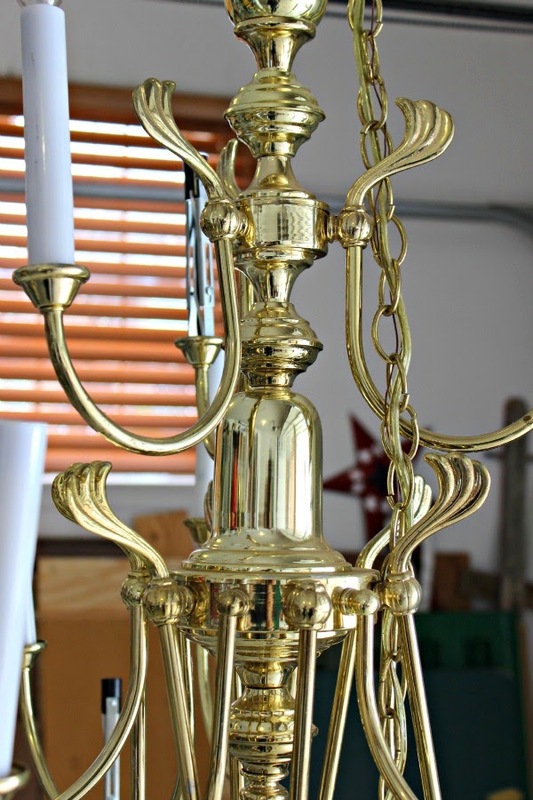 I used Rustoleum's Metallic Brass (hard to find anymore) to spray it. I decided to paint the candle covers also so they wouldn't stick out as much. 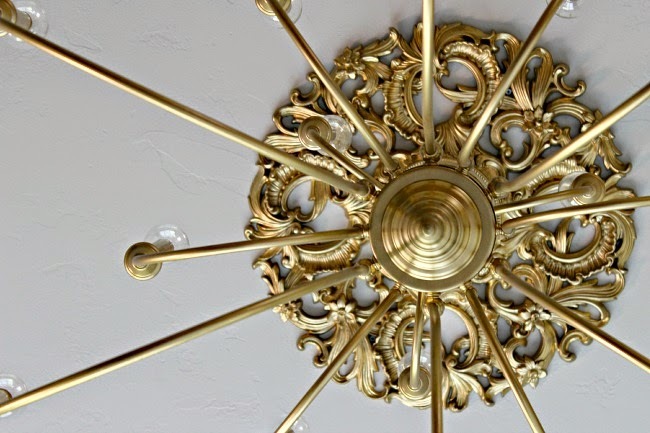 Right around the time I was working on the light, I saw this random clock pop up on Craigslist too ($10), and I immediately envisioned it as a ceiling medallion. The clock face was a thin piece of metal, so I removed it and the hands and was left with a plastic center. I used the Dremel again (it's actually my Dad's, I think I need one on my next Birthday list!) to cut an opening out. The edges didn't need to be perfect because the light canopy would cover it up. After a quick coat of paint to match the light, it was all set. The medallion went up first, taking care to make sure it was centered exactly. We attached it to the ceiling with 2 screws that aren't even visible from the ground. Then, my husband installed the light. It took a little bit of trial and error since the canopy wasn't attaching directly to the ceiling. I ended up using Gorilla Glue to stick it to the medallion. Globe bulbs finished it off for the modern look that I wanted. I prefer the clear bulbs but opaque are available also. It's a large scale for the room, but I love it that way. The simple lines and airy arms keep it from being overpowering. And, we can SEE in our room! The ceiling fan light was always so dim. This one feels like the sun... we need to add a dimmer to it. 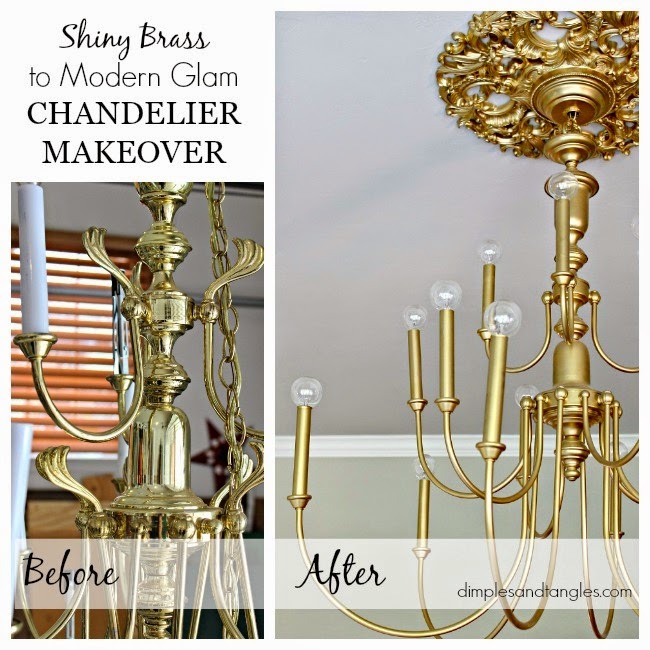 I think lamp and chandelier makeovers will always be my favorite. Check back tomorrow for a Week 4 progress report on my bedroom! Updated: See the finished space here! OHMYLORD!!!!!!!!!!!!! i love love love love love and love a little more. 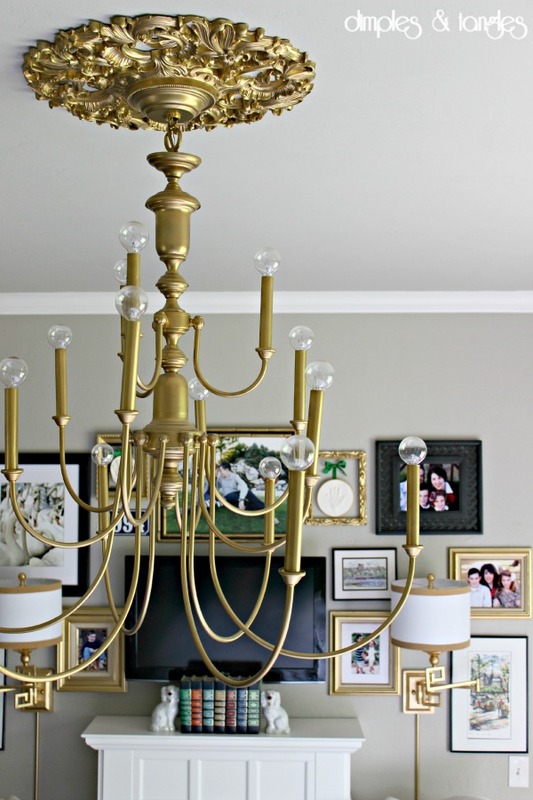 Love the ceiling medallion idea! It looks fabulous. I love the clock used as the medallion. Genius. GAH!!! It's really stunning!!! 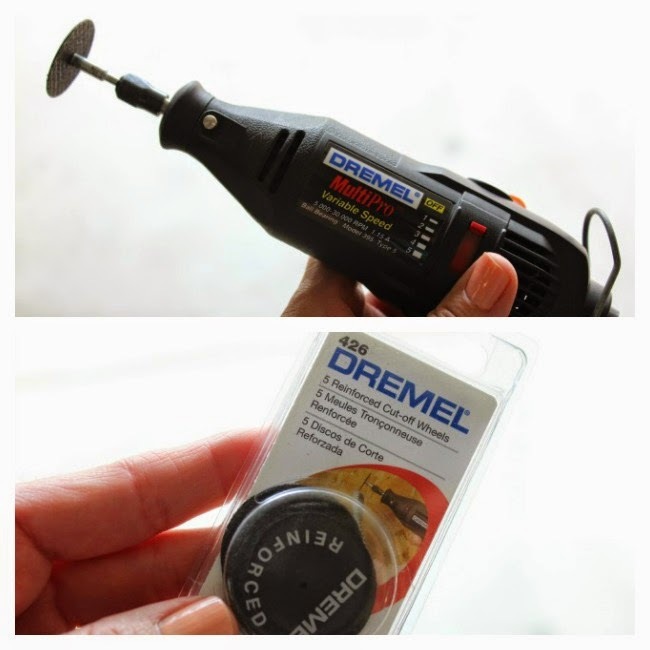 You definitely need to get your hands on your own dremel! ;) I think I need one too haha. AWESOME makeover as always Jennifer!! Jennifer!!! I love love love it!!! It looks SO good! 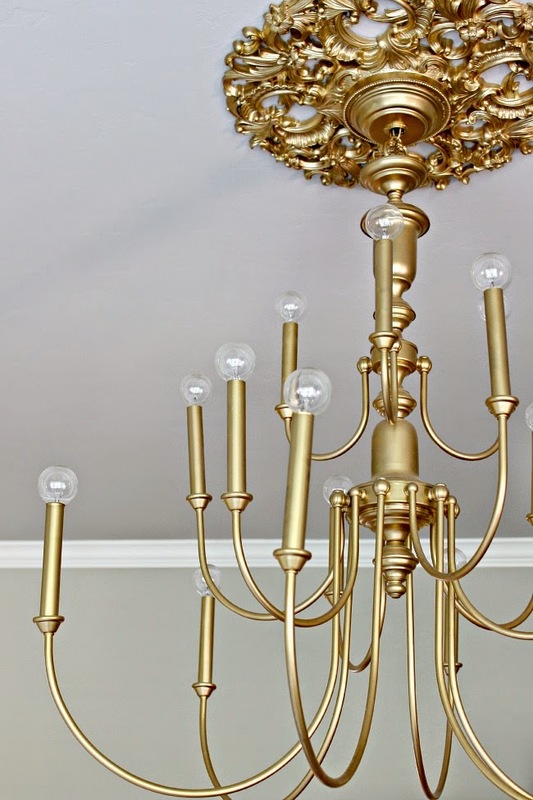 This is a really smart idea for modernizing a brass chandelier... 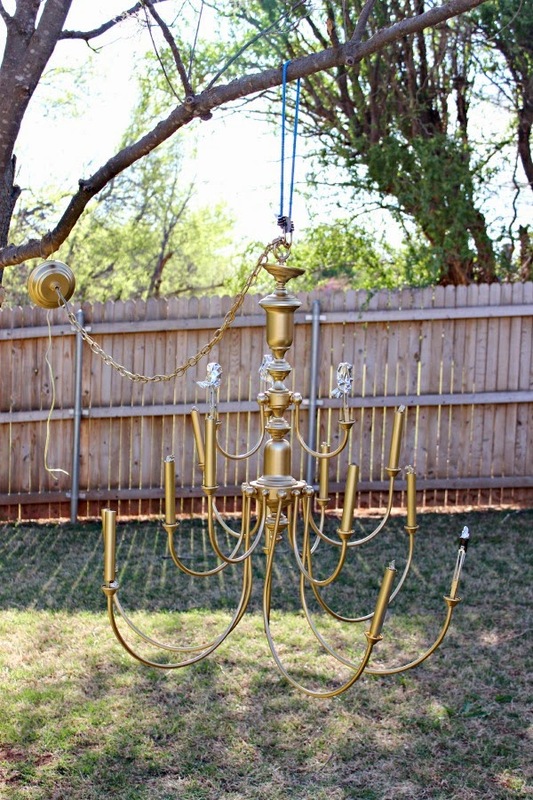 They are so cheap on craigslist; I might have to do this for my lighting fixture updates as well! Wow! You are so creative. 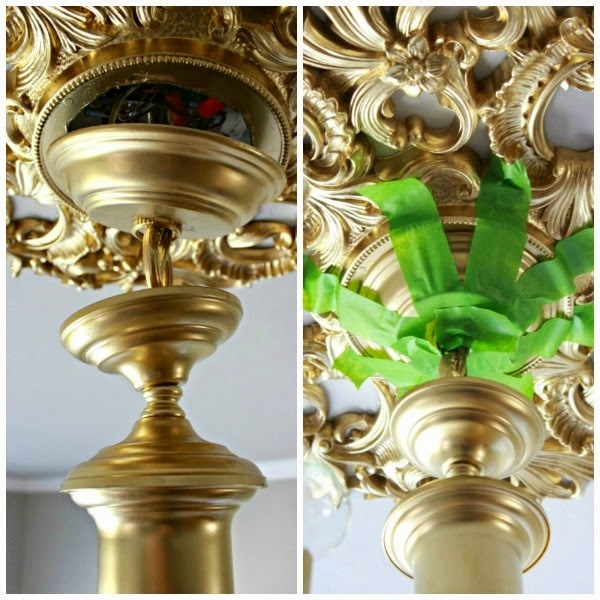 The clock turned ceiling medallion is genius! OMG, this is soooo gorgeous Jennifer!!!! Can't wait to see the whole room!!! YOU did it AGAIN!!!! WOW!!! That looks awesome!!! That is so grand and amazing. I love it! Beautiful!! can you tell me where you purchased your light bulbs? 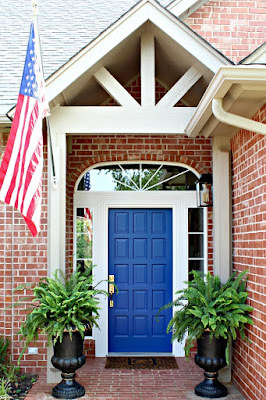 This is one of my fav DIY posts so far! 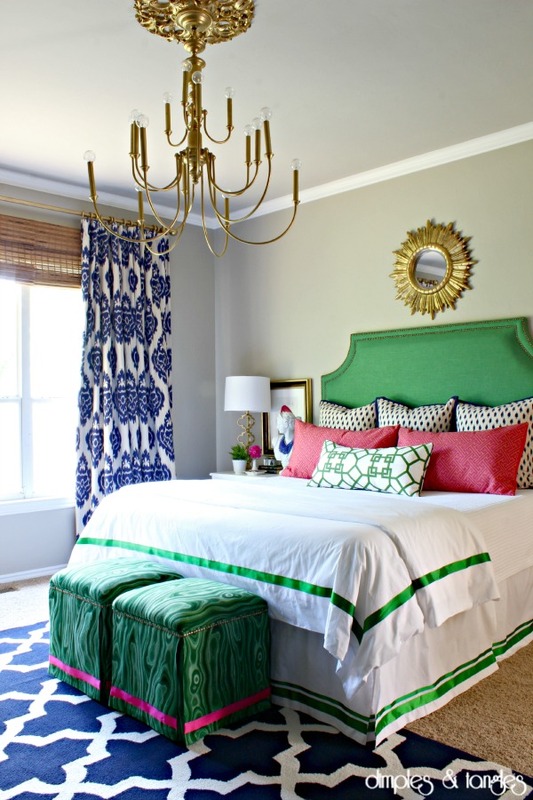 ~ Mod is not usually my style, however I love the lines, colors, ceiling medallion and bulbs! You and I have a lot in common. 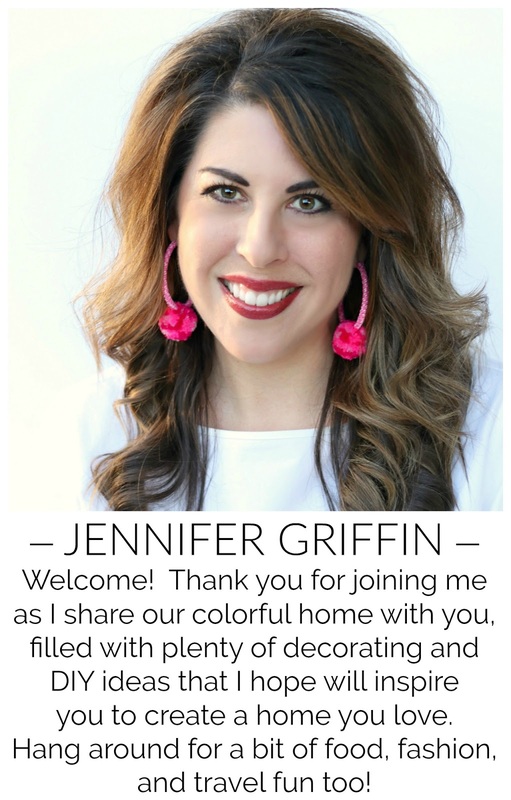 ;) Pastors wives, but decor obsessed and creative! Oh la la, love your great vision and clever thinking for the ceiling medallion!! Thanks Shelly! This room is ending up with lots of projects I'm really excited about! Definitely, Jessica! They are usually so easy to find. I waited a little while to find a larger one, but there are usually tons to choose from. I love what you did with the light Jennifer! It looks so expensive and cool! My gosh, I love this so much I barely know what to say it about it! It is such a showstopper now! Tips for how you locate such cool stuff on Craigslist??? I don't have as much luck. GREAT PROJECT! You are the master of thinking of creative new uses for things! 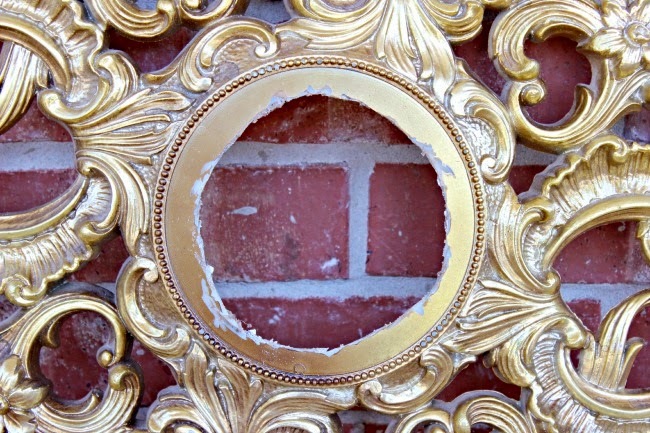 Love the clock-turned-medallion, great idea! And the more muted gold is so pretty too. I have to tell you, I think this is one of my most favorite DIY's to date! AMAZING!!! Thanks for the inspiration! You are so clever! I never would have thought of the clock as a ceiling mediallion! Stunning! Just very, very clever and beautiful. how smart are you?! Brilliant ideas! gorgeous idea. 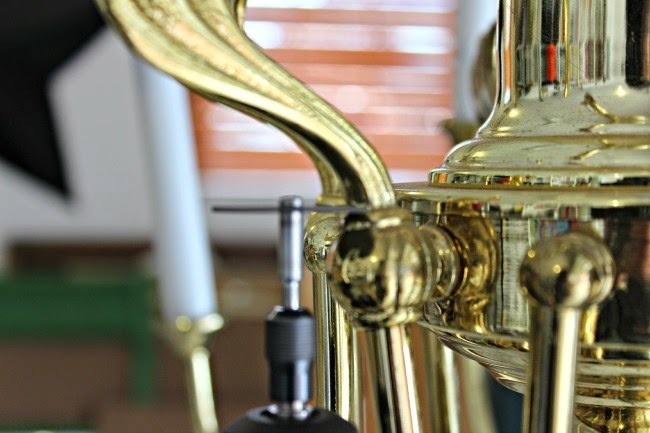 a nice fresh take on an outdated finish. Can you tell me where the bulbs are from and their size and watts? And I love the red lights in your kitchen in today's post. I'd also love to know where you find those bulbs. Can you please share? Thanks! Love this! 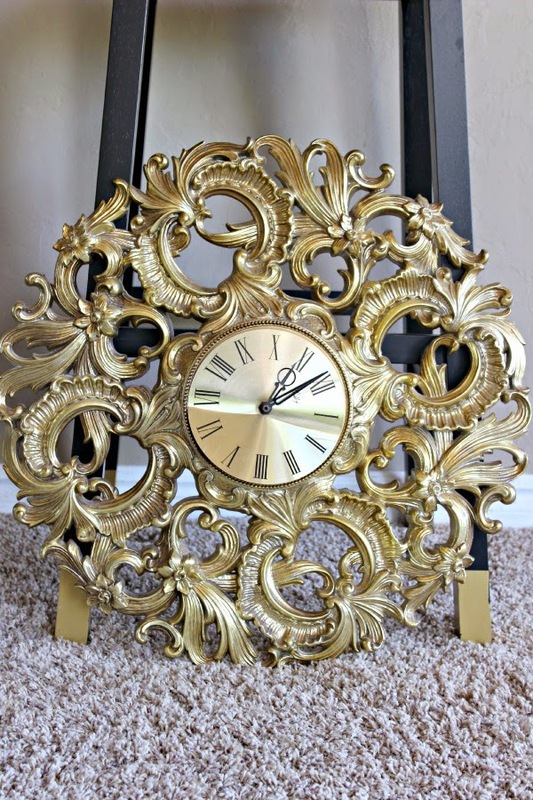 I have my grandma's clock like this so was excited to see what you would do with it. Wow, I was blown away!!! Amazing job! 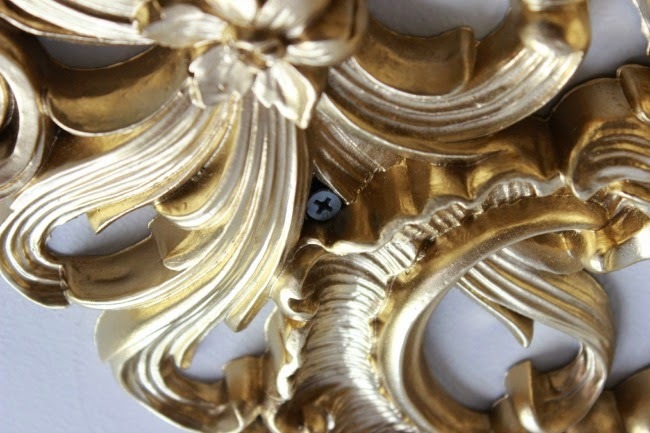 What color brass spray paint did you use, antique or burnished or another kind? Thanks! I love it!